Supplying windows and doors to the construction industry is a fast moving business – it’s an environment that Whiteline has thrived in for nearly 30 years. 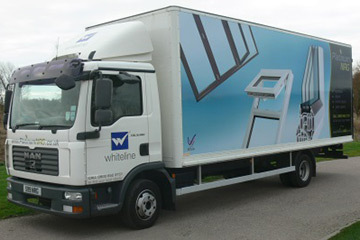 Whiteline is a full-service window, door and conservatory fabricator and supplier, based in Eastbourne, Sussex and serving installers across the South and East of England for nearly 30 years. The company is committed to supporting its retail clients with quality products – like the energy efficient PlatinumNRG range, quality service, innovation and customer support. Whiteline is committed to innovation in both products and its services. With this in mind, it looked at improving delivery accuracy to its customers, thereby eliminating missing items and ensuring only full deliveries are made. This would not only improve the level of service, it would also reduce the costs associated with having to reschedule, reship and resupply items at Whiteline’s expense. “We need to know that what goes on the delivery vehicle comes off it and that it all comes off in the right order and in the right place. Traditionally, customers in their eagerness to help with the delivery and get their orders off the vehicle will inevitably assist the driver with unloading. They’ll grab incorrect items or they’ll leave some of the goods due to them on board the vehicle. Unfortunately, it is only after the event that such issues come to light,” says Ken Gray, Head of IT for Whiteline. “We then have to reactively manage and put right any discrepancies, which impacts our resources and holds up work for our customers. We have been working on improving this, so that delivery accuracy is improved hugely and we can proactively manage any issues that occur,” he adds. Whiteline uses advanced manufacturing and accounting systems that have been developed specifically for the company. These interface with each other for maximum efficiency. Two of these systems are tailored to Whiteline specific needs: one handles product design and the other enterprise resource planning (ERP), which also provides order management. The accounting system is an off-the-shelf program. The company wanted an electronic proof-of-delivery (ePOD) solution that would enable orders to be sent directly from the ERP system to a semi-rugged PDA. This integration would enable the driver to have the exact details of each order visible on the PDA and have the facility to scan off deliveries, automatically recording the items as well as notifying him and the office of errors. The ePOD system would need to be easy to use and cost-efficient for Whiteline’s small delivery fleet of five vehicles that make around 12 GPS tracked and timed deliveries each day using predefined routes. Whiteline investigated available solutions and selected OBS Logistics to supply a Microsoft SQL-based version of its proven CALIDUS ePOD system for hosting on its own server. “OBS Logistics offered a competitively priced solution that is very flexible, allowing us to expand its functionality as and when we require it. Essentially, it will provide the accuracy we need to boost the quality of our deliveries and customer service. We will have a real-time view of the deliveries, showing what has been delivered to each customer and allowing us to address any inaccuracies immediately; this will have a significant impact on our quality of service,” says Ken Gray. The industry sector Whiteline operates in requires the company to proactively manage its accounts, this means keeping on top of the financial elements. This creates a lot of credit management and debt collection work for the Whiteline team. The new ePOD system will enable this to be managed more efficiently because customers will receive instant proof-of-delivery when the delivery is received and signed for. It will eliminate mountains of delivery notes that need processing before raising invoices. The system will also notify drivers whether they should be picking up cheque payments on site before making a delivery – and, if they fail to collect a payment, it alerts the Whiteline credit controller of the outstanding payment, enabling swift follow up that day. "The industry works on payment in arrears because of cashflow issues, but sometimes this can become a problem for us. The system will enable us to take much greater control of these outstanding payments. We anticipate being able to deal with debt collection more efficiently and reduce the administrative workload so that our people can have more time to service our customers. This again will be a way to improve our quality of service," explains Ken Gray.